Heads up, Whovians, because the Doctor has landed on the iPhone! In case you didn’t know, Doctor Who is one of the longest running and most beloved British television shows, and Doctor Who: The Mazes of Time is an officially licensed app for the iPhone and iPod Touch put out by the BBC featuring the Eleventh Doctor and his lovely companion, Amy Pond. Unfortunately, while fans may be excited for this time traveling romp, others will find themselves disappointed by the lackluster controls and largely bland gameplay. 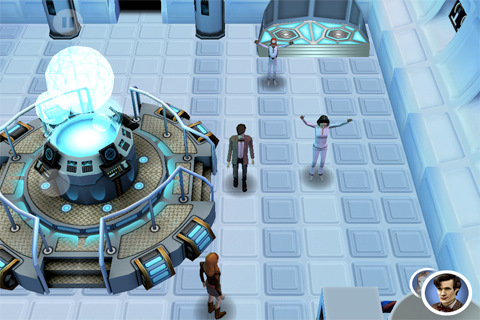 This 3-D action-adventure puzzler features the Doctor and Amy caught up in yet another twisted plot where they must save the day. Surprised? Of course not, but moving right along! Anyway, our dynamic duo must work together, tag-team style, to solve puzzles, avoid danger, vanquish evil, and repair all of that wibbly wobbly timey wimey stuff they do so well. Puzzles mostly consist of crawling around labyrinthine structures in search of vital components to collect and various important looking switches to activate. There are dozens of puzzles, but initial ones are very basic, and while they do get a little harder eventually,it’s not by a lot. The general structure of a level goes something like this: “Move Doctor to switch. Swap controls to Amy. Move Amy over deactivated spikes to other switch. Swap back to Doctor and move him over spikes. Move both to exit.” Hooray! Don’t you feel so accomplished? Of course, as you progress, things do get a bit more interesting. The Doctor and Amy have different strengths and weaknesses that you have to take into account for later puzzles, and classic Doctor Who baddies like the Cybermen show up to add an element of danger, but even then, it’s really not much of a challenge for Time Lord or human intellects. The only thing that makes the puzzles particularly challenging are the sub-par controls. Occasionally puzzles will rely on split-second timing or deft maneuvering, and that’s rather difficult when using the virtual joystick is like swimming through mud. Slow, fickle, and just fussy all around, the controls were terribly disappointing for such a high profile app. Thankfully, the writing is surprisingly good, capturing some of the show’s brilliant humor in the zippy banter that accompanies the puzzles. It doesn’t quite make up for the molasses slow controls and unmotivated puzzles, but it soothes the pain a bit, as do the app’s sounds and music which have been taken straight from the show. Alas, the graphics, particularly the environments, don’t quite catch the spirit of things, but at least the Doctor and Amy are recognizable. I confess, I really wanted this app to be great, but history has shown time and time again that licensed games tend to be pretty disappointing, and Doctor Who: The Mazes of Time is no exception. While it’s far from a total failure, it just doesn’t really satisfy. 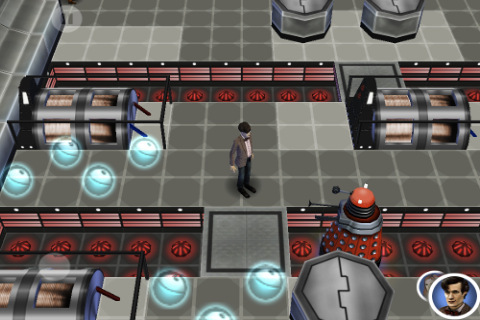 AppSafari review of Doctor Who: The Mazes of Time was written by Tracy Yonemoto on June 7th, 2011 and categorized under Action, Adventure, App Store, Board, Games, Puzzler. Page viewed 5504 times, 1 so far today. Need help on using these apps? Please read the Help Page.